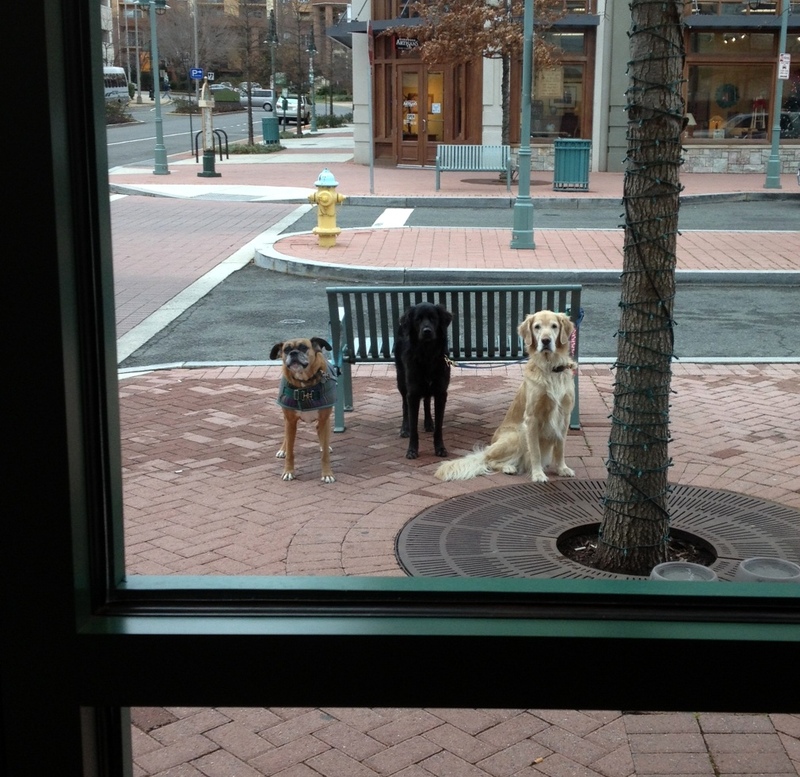 According to the ARLNow blog, Arlington County’s Health Department has decided to allow restaurants to let patrons bring their dogs into outdoor dining areas! That’s great news for dog owners who have limited opportunities to enjoy outdoor dining with their dogs. Even Shirlington Village, with its bountiful cafe seating, was not easy. You had to hold out for one of the few tables adjacent to the sidewalk so you could tie Fido on the outside of the barrier. And on a sunny warm evening? Forgetaboutit. Over Easter weekend, I went to a darling restaurant in West Chester, Pa., called the Four Dogs Tavern. Awesome food, but even better atmosphere, because just about every table on the expansive patio had a dog (or two, or in our case, three!) attached to it. Speaking of dog-friendly Shirlington, a new restaurant is going into the space previously occupied by Bistro Bistro, named Copperwood Tavern. « Pups in the park season: play ball! Oh, this is so exciting! I just love dining outside with my whippet Olivia!!! It’s about time. I went to Cap City in Shirlington with a dog. They still required dogs to be on the outside of the railing. Unfortunately it sounds like Cap City hasn’t applied to the County which they need to do first: http://www.arlnow.com/2013/04/03/health-dept-to-allow-dog-friendly-outdoor-dining/. I do know that the Shirlington Village management company, Federal Realty, gave all the restaurants a copy of the form and encouraged them to send it back to the County! Next time you go, ask the manager why they haven’t done it yet–happy customers come back!